Ciao! 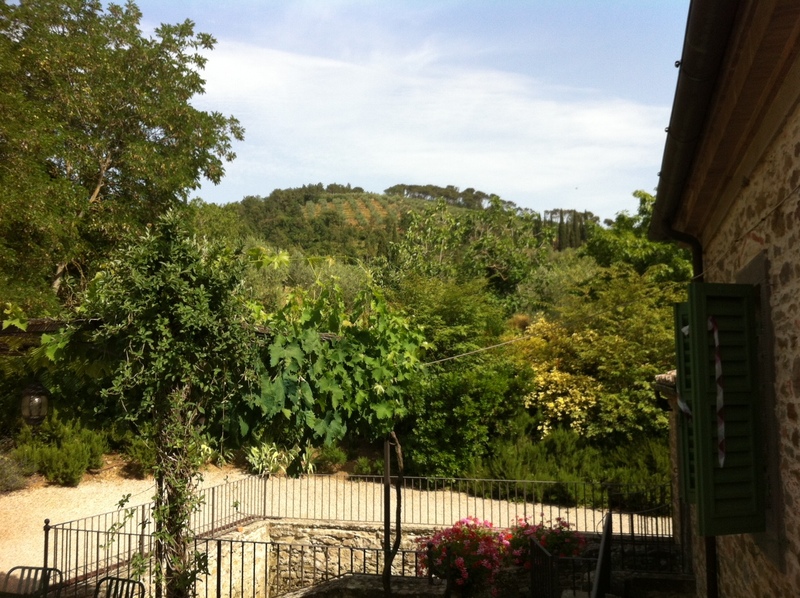 We are enjoying our vacation in Tuscany, Italy! Hee! It sounded so funny coming from a 12-yr-old, but the thought HAD crossed my mind – if I keep eating like this, I am going to gain 80 pounds before we get home! The delectable fruits and vegetables are on display at every frutteria and we devour them. The cantaloupe is so delicious, Chris, who for 19 years of marriage told me he didn’t like cantaloupe, has requested it, asking if it is the same fruit as we have at home. I enjoyed my first “fico” two years ago here, and now recognize the figs growing in the tree next to our rented villa’s pool. The green peppers, though shaped like jalapenos, are sweet- not spicy- and when sautéed in olive oil, entice even the kids. Fruits and vegetables are delicious; however it seems we are breaking an unwritten law if we don’t partake in the pastas and pizzas at restoranti who boast theirs as best. The battle of the bulge needs a counterpart – exercise! Since Anytime Fitness doesn’t have a branch near our villa (LOL) and stone floors prevent indoor workouts, walking it is! Our villa, however, is at the base of a mountain. (OK, maybe it is a “hill” to those who live in mountainous places.) There is no leisurely stroll around a neighborhood. Narrow streets which seem to have been made for chariots leave no side room for pedestrians, so my only option is to CLIMB! As the story goes: there are two wolves fighting inside my head. One wants to do good and the other wants to do bad. The one who wins is the one who gets fed. “Oh but the birds are singing. I just want to sit and read!” The Bad wolf began. “But I don’t want to roll home looking like a gnocchi.” The Good wolf smarted. “I can just go later today.” Bad was pleading. My internal battle of a “good wolf vs bad wolf” continued silently while I tied on walking shoes. I began the ascension in full denial of desire to do it. I just knew it was the right thing to do and the right time to make haste. As I walked in the woods, a path cut last year was visible, but overgrown and itchy. Bugs seemed to jump from the leaves to my calves, then scurry, panicked at their arrival on foreign skin. 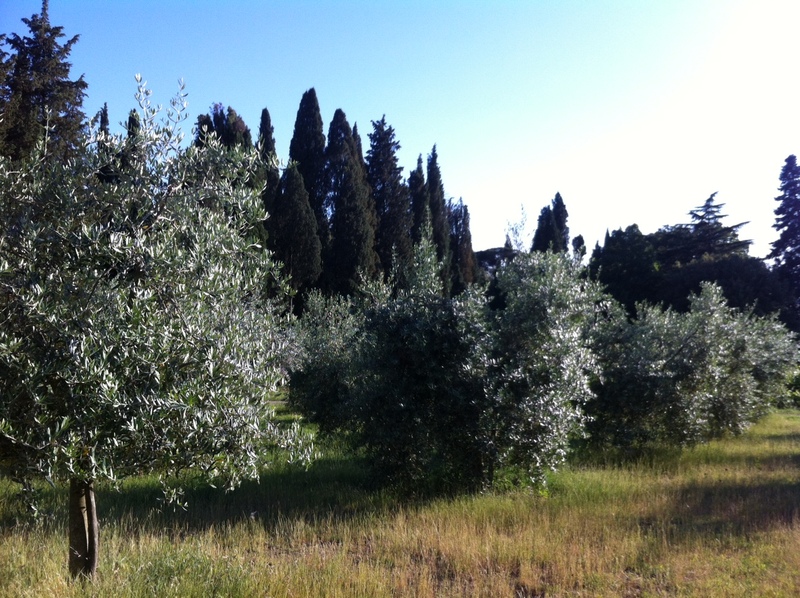 Olive grove on the property of the villa we are renting. 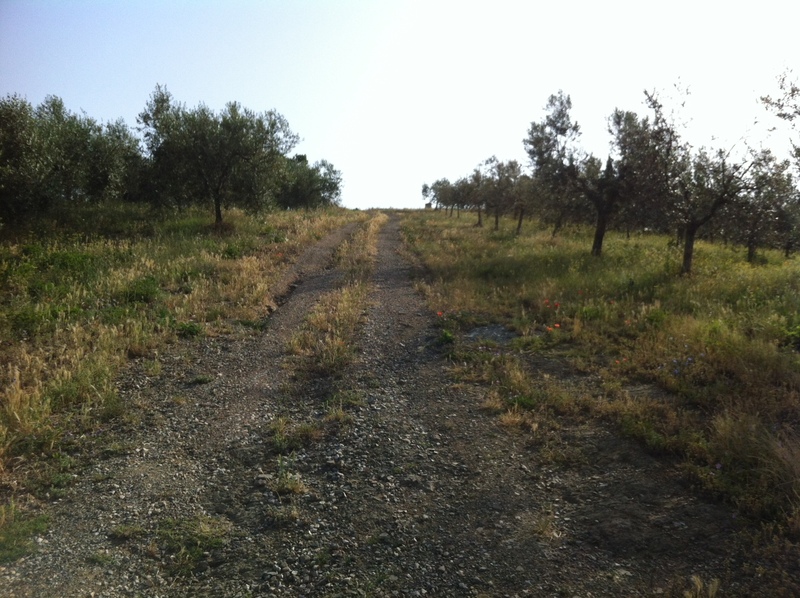 I tried to remind myself of other hefty walks up Italian mountainsides in years past. The victory. I don’t know any view could surpass the view from La Contea, a villa we had rented on the side of a mountain last year. Its mountain had a church circa 1300A.D. 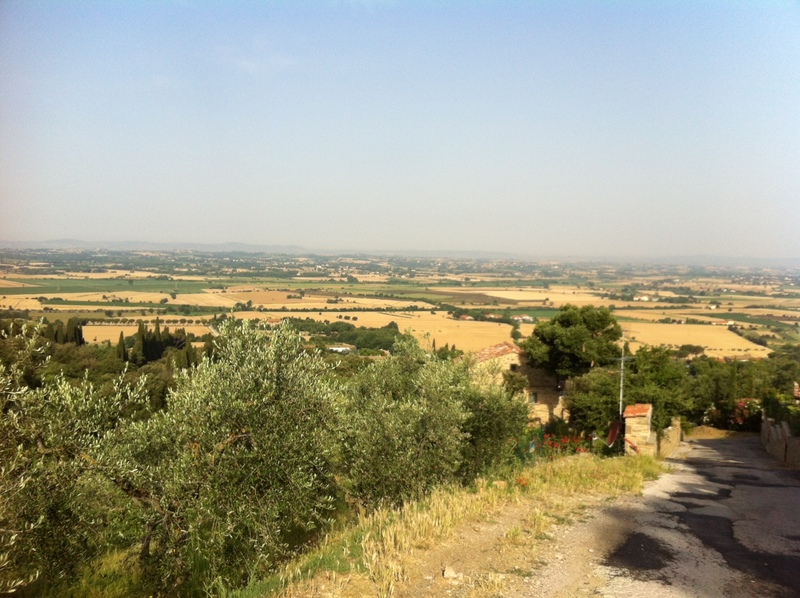 at its apex, and revealed a panoramic view of Tuscany for incredible sunsets! I turned upward on the mountainside. The steeper it got, the more I labored to breathe. “What’s the altitude here?” I wondered, thinking I must need more oxygen. “What if it is asthma?” My negative thoughts pelted me like biting gnats. “I haven’t exercised in the five days we’ve been in Italy; my lungs need the exercise to break through the pain,” the other wolf countered. What was that?! I heard it for sure. Something scurried to the right. The night before, the Brady dinner table had been cleared faster than ever. I had seen a snake cross the stone path just feet from our outdoor dining, and I yelled “snake!” to which all four kids (and I) reacted by jumping up from the table to chase the snake…who was chasing a lizard. That all seemed like fine entertainment – when the snake was in clear view on stones and preoccupied with a different prey. But now? On this mountainside, it seemed so dangerous. “What if I got a snakebite and Chris and the kids would have no idea where I was? They say you die from a viper’s bite if you are not at the hospital within 30 minutes.” I pressed on, trying to reframe my thoughts, but watching the ground where I trod. But I had just read in Resolved (by Orrin Woodward), Joe Frazier’s famous words, “If I cheat when the lights are out, I will be found out under the big lights.” In other words: if I stop in the woods instead of continuing my climb, I will look like a gnocchi in no time. 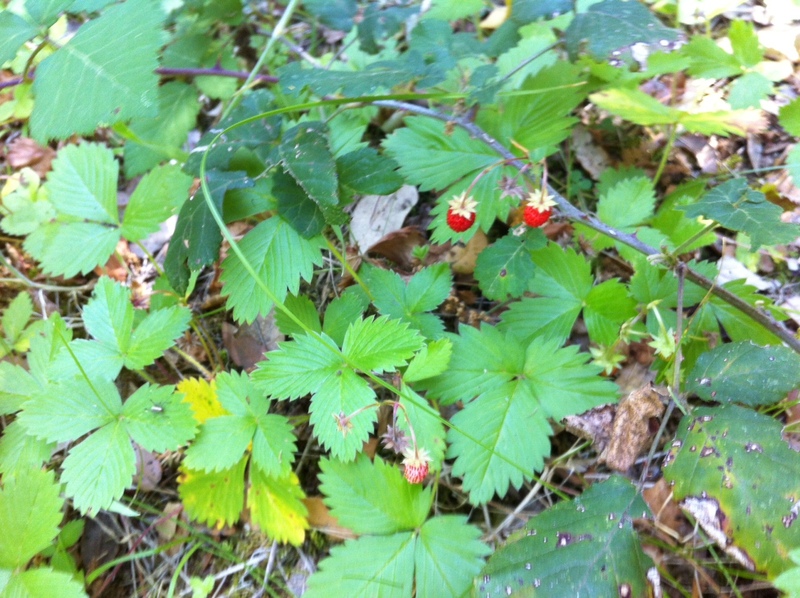 The dense woods were irritating my legs – maybe there was a road, a place someone had already prepared to get to the top? If you seek, you will find – and there it was. I cut to the left, and found pavement. Now, I could make some time! I hoofed it into gear, the exercise actually feeling good. As I rounded the corner, there was a glimpse of the view to come: from maybe halfway up the mountain, but still worthy of a photo. I stopped briefly for the snap, but my energy increased as I realized more that the victory of the mountaintop view was going to be sweet! Sweat was now pouring off my brow and down the sides of my torso. The clearing provided a view, but it also provided direct sun. The road revealed a few villas for which it must have been built. A man was watering his garden, full of roses. Vines of gardenias (I think) grew on the fence, providing complete privacy for what I assume was a pool. “Buon giorno!” I said, hoping I wouldn’t startle him as I passed. Half a mile later, I heard a nerve-shattering noise: a dog barking. I don’t mean the yapping of the little dogs I am used to in the North Carolina neighborhood; I mean blood curdling, guard-dog, trained-to-kill kind of barking. (Funny how my imagination grew!). This past Sunday’s sermon came to mind. Ironically, my son Nathaniel (12) had volunteered to do a sermon for our family worship, since the Internet would not allow webcast from NC as planned. He had chosen 1Samuel 17: David and Goliath. My young boy read the story and expounded with analogies that made it come alive. I saw his heart shine, relating to young David’s bravery. “The other people had a cup full of fear,” he said as he lifted his own drinking cup in display, “but David had a cup full of faith!” He continued to teach us that the Philistines (Goliath’s “team”) ran away from the Israelites (David’s “team”), not because a stone had killed Goliath, but because they knew there was faith in a powerful God behind that stone. The dog saw me before I saw him; I could tell because his bark turned from “communication” (as if telling his owner he had heard something) to a ferocious snarling, saliva-dripping “warning if you take one more step” kind of bark. The german shepherd looked three times the size of any of its type I had seen in the past. Clearly from an episode of “Cops,” it bared its teeth as if full of wrath. A 3-foot fence was between the dog and me. Was it a joke? The dog could vault that in a heartbeat. This house, high in the mountains clearly had a guard dog. “Cup full of faith. Cup full of faith.” I tried to calm myself, avoiding eye contact with the dog as I walked, trying to remember if that was the right thing to do. I clutched the stone in my hand, but I think my edgy nerves had removed my ability to throw it. “Cup full of faith!” I argued back with myself in silence. Phew! I made it. Another hairpin turn past the dog’s house, and I was facing directly UP. My thighs burned as if climbing a ladder. Maybe ¾ of the way up the mountain, and the view was still worthy of a photo. As glorious as it was, it sincerely gave me energy to climb further. I wanted the TOP! I paused for a photo and a breath, then continued. Scampering noises on both sides of the desert-like conditions haunted me as I climbed. At one point, the rustling stayed longer than usual, so I stopped to peer into the deep, dry grass on the side to find the source of the sound. A tortoise was making its way. Its “scurry” was more like a labored stroll. I looked straight ahead, straight up, and surely, it was the top. 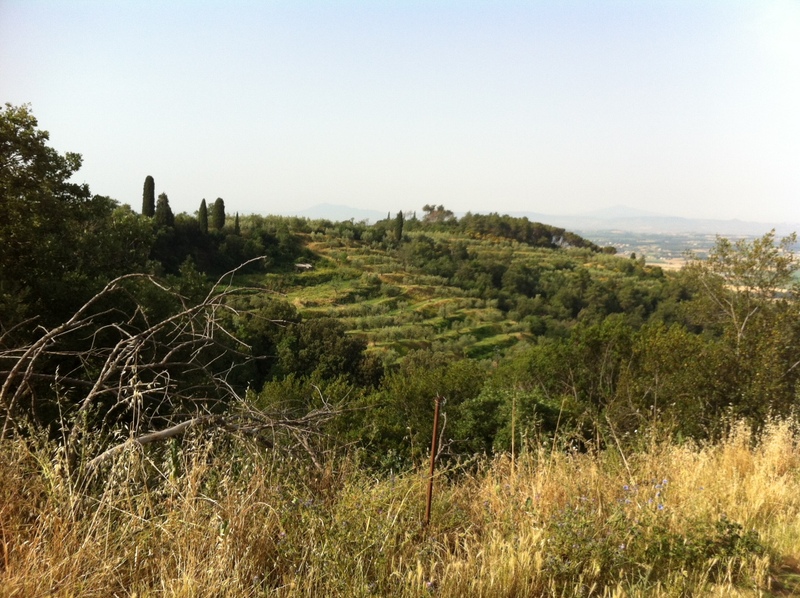 I feared I would crest that walk and it would only reveal more mountain, yet the olive grove I had pictured from my villa below, was now below me, so I knew I must be close. The pavement disappeared into gravel. 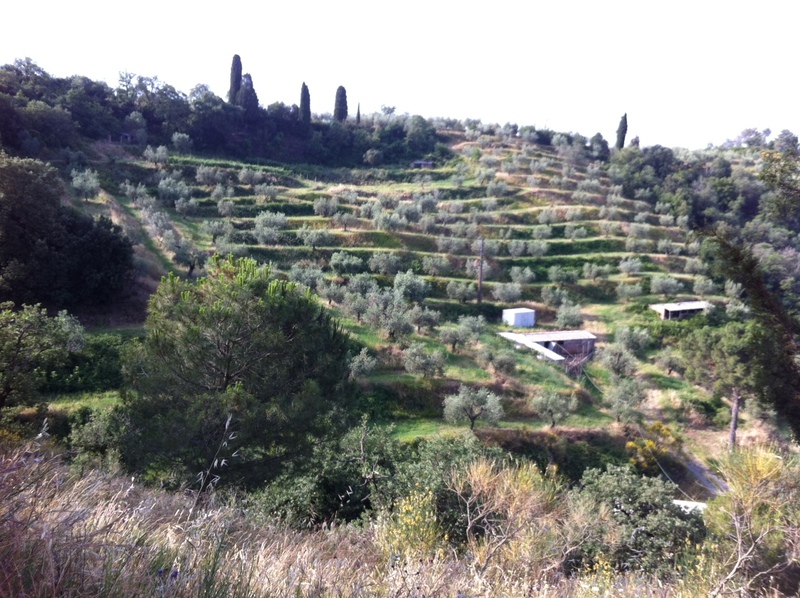 From my front porch – olive grove barely seen at top, center. “I think I can, I think I can!” I quoted my favorite childhood tale of The Little Engine that Could. I hoped that what was in view was really the last of the climb. “I will beat my body into submission!” I quoted a favorite Bible verse (1Cor 9:27) that gets me through many grueling workouts. 10-9-8-7-6-5, I counted down, as if I were driving across a state line in the US. My step crowned the hill. Before me (to the North) was a 70 acre plateau which looked like it had once been cleared for a farm to soak up the unobstructed sun. Sweat dripped to the ground. My pounding heart seemed to be demanding the break, but I turned to see victory spelled across the valley. 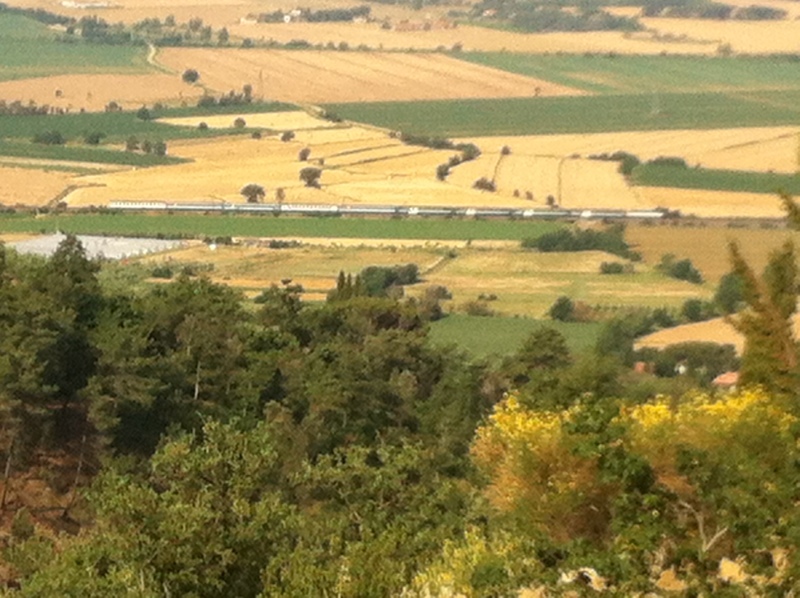 The Tuscan countryside on my left (west) looked like a patchwork quilt. A green patch of beans was beautiful next to its neighboring patch of a yellow wheat field. Interspersing sunflower rectangles would change colors from green to yellow and back, as the flower patch followed the sun in unison throughout the day. Tall cypress trees lining driveways of villas could be seen, though they were 20-30 miles away. 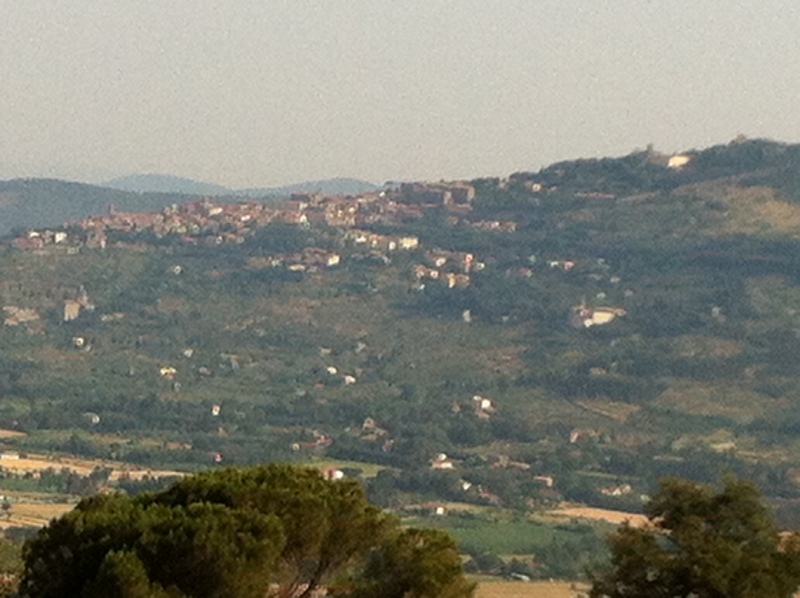 The ancient city of Cortona was visible from here atop its neighboring hillside. On cue, the train from Torontola moved across the mural, making everything else seem still, like the electric train on Mr. Rogers’ Neighborhood. 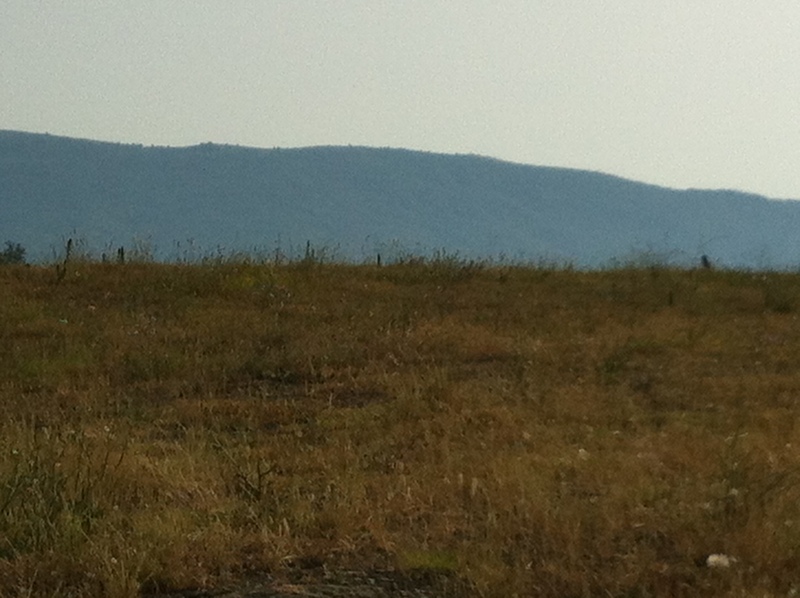 The view to my right (east) was completely different – reminding me of the smoky Appalachians. Deep green trees covered the mountains, providing plenty of hiding for the deer and hundreds of cinghiale (wild boar) which I had seen on previous trips to Italy. The still-rising sun was already sweltering hot at 9am. – Taking a road to the top that has been paved by others makes your legs less itchy. – Once victorious, sharing with others becomes a passion. When God gives you a victory, you truly can’t wait for others to come along to experience it. May God bless you with a reason to climb, and a will and way to do it! Good things come to those who climb! 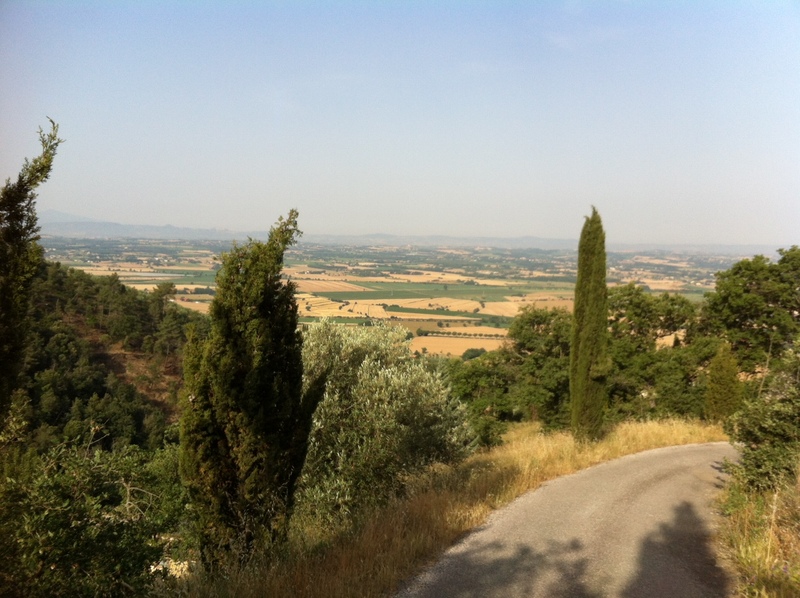 This entry was posted in Freedom, Health of It, Personal Growth, Rooted in Faith, Travel, Uncategorized and tagged attitude, Bad wolf, Chris Brady, climbing, Cortona, Italy, motherhood, Orrin Woodward, positive thinking, The Life Business, Tuscany by Terri. Bookmark the permalink. Way to go! Your cup of faith is spilling over into so many others’ lives and paving the path. Thanks for your example. I love traveling in your thoughts along with you. You take us readers on all the bends and bumps, slips and trips, laughter and tears all leading to a greater experience in our own lives. Your style is warm and inviting and completely exposed, allowing your reader to believe the heart of your messages. Thank you dear friend for inviting us all over the threshold of your life. Continue with the travels, write about them…I’ll be waiting for you on the cobbled path of your words. Thank you! Today my son is moving out because he feels that I am overbearing in my caring for him. He is old enough but without work. All morning the two wolves have been going on their battle inside of me. I am thankful that faith can still the fear. Awesome story Terri! What a climb and view! Beautiful! Just beautiful. Thank you so much for sharing and for being a GREAT example to all of us ladies! Love and prayers to you and your family! Awesome story Terri! Love your perspective and insight on your climb. Love the view. Thank you so much for sharing. I can only imagine the fun you had sharing your adventure with your beautiful family. Thanks for all you do with Life, Team and this blog. Love and prayers to you and your family. Thank you, Terri, for this wonderful, refreshing and exciting post of overcoming. Thanks for sharing and “taking” us along with you! God bless! I love it, Terry!! Thanks for the reminder of climbing UP!!! Terri, My day was not starting to good, your story helped me get going and stop feeling sorry for myself. You inspire us no matter where you are. What a wonderful story — and thank you for the pictures! I have sooo many mountains — it’s embarrassing — and sometimes hard to know which one to focus on first! I appreciate so much the scripture Phil 2:13: “For it is God who works in you to will and to act according to His good purpose” which gives me hope and faith that through HIM I can climb all my mountains! Thank you Terri for being an amazing example of this scripture! You are so transparent in your blogs and on stage; it is obvious that you are who you are because you’ve allowed God to work in you! As always, thank you for sharing the story and scripture! What a wonderful parallel and lesson! I definately have my “mountain to climb” of learning how to be grateful no matter what the circumstances. Once again, my spirits are lifted to see another side of the world from your point of view as you share your heart. Thank you Terri! God had blessed me with a will to climb, a will to do more and get better and one of the ways to do that is to immerse myself into HIS word, the team system and then share both with passion and conviction. I had the pleasure of having my deceased mothers only living sibling in my home for the past few days and her edification of me, my family and my home has truly been humbling. Yet, with every comment I am even more thankful and convicted to do more for HIS glory by loving HIM and serving HIS people. “The Climb” although frustrating, challenging and rewarding is what wakes me up in the morning, has me daydreaming throughout the day and keeps me on my knees at night. I love it! Thank you for sharing! and teaching at the same time!! Reading your letter today was truly a message from God for my weary soul! Since you asked, I am currently climbing two mountains: battling excess weight (finally starting an exercise program that I can actually visualize myself maintaining) and starting a family. You asked readers to share what we feel will be our first photos of “proof” that we are making progress on our journey AND as proof that God gives us gifts along to way to honor our faith in the “good wolf” so here are mine: 1-being able to sit in the presence of others with absolutely NO awareness of my tummy (not feeling the need to camouflage it with my hands, or a book, etc. ), and 2-a positive result on a pregnancy test. Thank you for sharing insights into your battle with the climb, and for challenging me to SEE my successes along the journey on my own mountains. Doy gracias a Diós por su vida. Thanks so much for such a wonderful illustration and story! It will surely be hard to forget. And thank you for remembering and taking the time to think of and communicate with us so vividly and beautifully while vacationing in that place you and your family love so much. Have fun! Thanks for this post Terri! I’m so excited to hear your thoughts that you had while climbing the mountain. It’s exactly what I would be been thinking too. I totally could see myself at peace that my husband could find me by tracking my cell phone 🙂 I have a few mountains to climb….ok maybe a handfuls…one of mine is growing in my walk with Christ. It’s been placed on my heart to have a heart more like Jesus. I read this and it hit me: 1 Corinthians 8:1-3 ” … Knowledge puffs up, but love builds up. The man who thinks he knows something does not yet know as he ought to know. But the man who loves God is know by God.” Paul is teaching we can learn God’s knowledge only after loving him. I have a great friend and mentor Lynn Mossner and today she recommended me to read “Stepping Heavenward”. I’m excited to get my hands on that book. Have a great time in Italy and keep the letters coming! Wow, Terri! You have an incredible gift of writing that gets better and better. The transparency you offer makes it all so inspiring, applicable, and real! Girlfriend, not only have you confirmed some things that have occurred in my life in the last 24hrs, but you got my elephant charging/climbing, lol… I’m definately printing out this one and reviewing it daily! Time does not permit me to share all the past opportunities of overcoming, but as far as mountains go, I guess the one most relavant is one that you addressed – becoming physically fit. 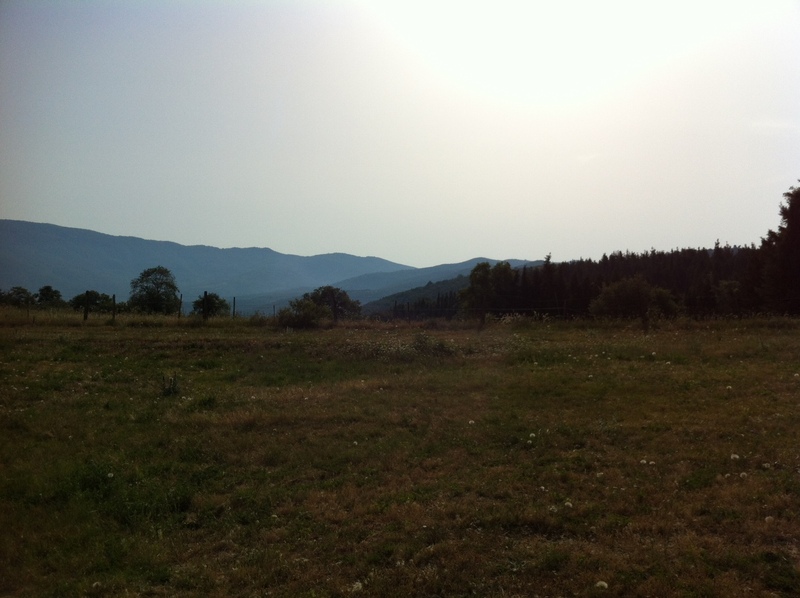 Actually, you hit two mountains in one blog- hee, hee! The one just mentioned and the opportunity to go “paint” Italy! So thanks for the “food” to feed my elephant!!! Btw… I got ALOT done today. ;D Blessings! Great post! I especially enjoyed the video–I could even hear the birds singing! One of my mountains to climb is “disorder”. My first picture as I conquer it will be of a clean desk and a clean mind, free to enjoy other things than what might be on my “to do” list. Thanks for the reminder, Terri! The mountain of the diagnosis of breast cancer was placed on my path in early January. The good news is God continues to be with me on this journey (currently through chemotherapy) and the gifts along the way are precious and many when I can open my eyes, mind and heart to them. (not to say that negative wolf doesn’t rear his head and his loud voice). The truth is: I have no doubt that it will all be ok in the end; and if it’s not ok,, it’s just not the end! Thanks for sharing your climb! Thank you for such a beautifully written story. It reminds me of the “Peaks and Valleys” book I read a few months ago. I don’t think I have any one big huge mountain to climb right now. I think my mountain is just my life as a wife and mother….stopping to take pictures (taking a break), looking at the breathtaking views around me (my kids), taking a path that has been paved by others (reading good books on marriage and parenting), and sharing the victories and views with others. I think this is a great way to look at my life right now, as a climb to the top. Thank you for the perspective. Wow! Your writing puts me right there with you on your trecherous climb up the mountain. I am reminded of my daily battle of exercising and those wolves who like to battle in my head, too! Thanks Terri! Terri, you have such a gift of teaching lessons through stories. You truly have the power to captivate your audience through your transparency. Thanks for sharing. Thank you so much for this blog. Your writting is wonderful. I am on the mountain of weight loss. I have a picture every single Tuesday of my progress! I have a dress that I will be wearing in the coming months once I lose some more weight. I thank you for all of your struggles you share with us. I am so excited to see and hear you in Milwaukee at the end of the Month. The Mental Fitness Challenge has been an amazing exercise. I find that I need to focus even more, as I want to climb mountains in EVERY area of my life. I need to attack the storm clouds of “self sabotage” too as I can turn around and run when the goal is just in sight. So much to learn, so many areas in which to grow, so many mountains to climb, but so much gratefulness to be on the journey. I need to remember that there are actually TWO wolves! The “big, bad wolf” seems to have eaten the good wolf. He’s gonna have to find somewhere else to eat from now on :). Thanks for reminding us of the journey and what amazing rewards we have waiting for us – at the end of the journey, but also in the midst of it!